This was originally a Ukrainian Cossack song, known as "Ochi chyornye" in Russian, which means Dark Eyes. I first heard it around 2004 in Toulouse when someone played the Django Reinhardt version, I was playing the rhythm guitar then and a friend of mine a broomstick bass with a wooden box. While I've always remembered the chords, I had forgotten about this song or what it was all about until quite recently when I met a violinist called Olivier with a small band during an open mic session at the Earl of Beaconsfield pub in Cambridge. Then I created some jazzy guitar chords for it, in the same key and following the original chord sequence but spiced up with a few more notes around. I also wrote some French lyrics for it; I didn't translate the original lyrics or read any translations but somehow got the spirit of the song and wrote my own lyrics while on holiday. Finally I mentioned it to Olivier and he was happy to record it with me, he played the violin and I played the guitar. I then added the electric double bass and vocals. The first part is some kind of waltz like the original version, and the second part is more of a swing version in four times. 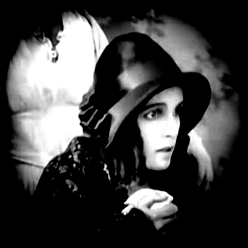 Also you might have noticed that I used this song in Nosferatu Act 1 silent film as a synth keyboard instrumental version. In the film, Ellen has dark eyes and Hutter thinks of her while he's travelling through the Carpatians and Eastern Europe. So after first using the original melody with the silent film, this time I took one picture from the film to illustrate this song. Now it's up to you to do something else with it!